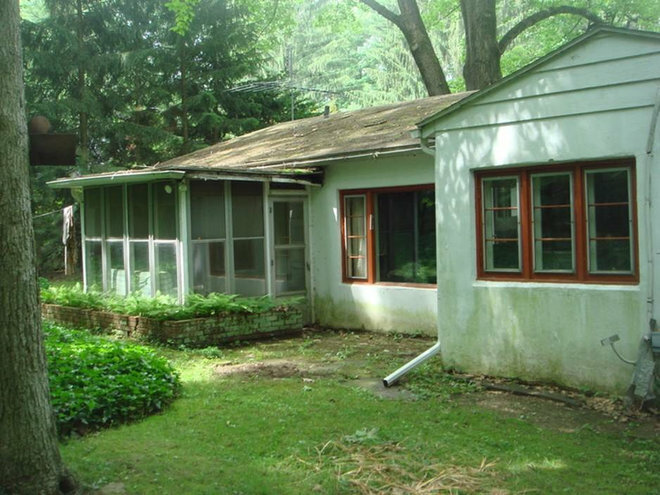 In 1974, Chicagoan Chris Lonn bought a 1949 cottage with three friends in Harbert, Michigan, a small summer resort town on the southeastern shores of Lake Michigan. Over the years, they converted the garage into a third bedroom and another bath, and built a large, screened-in porch at the front of the house. Other than that, the house, set on a large lot filled with oaks and evergreens, remained largely untouched for almost four decades. 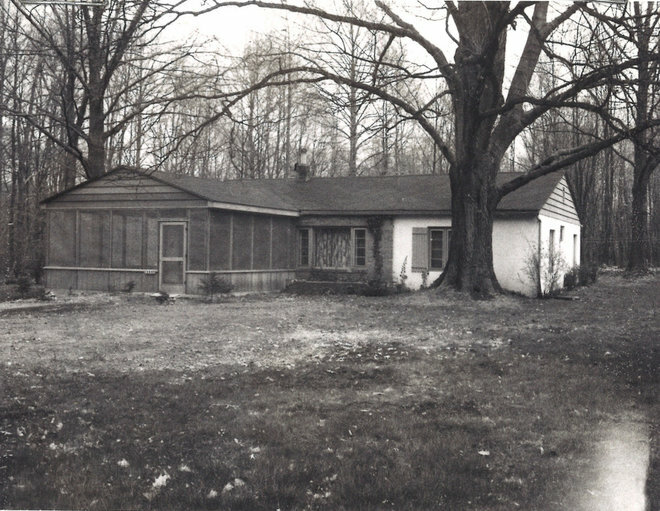 Lonn eventually became the sole owner of the cottage. Recently, he decided it was high time to do a major overhaul of the beloved weekend retreat — and the site of many fond memories — which had developed a laundry list of repair needs. With the guidance of Chicago architect Greg Howe, the house was modernized and winterized, but the renovation managed to stay true to the home’s cottage roots. 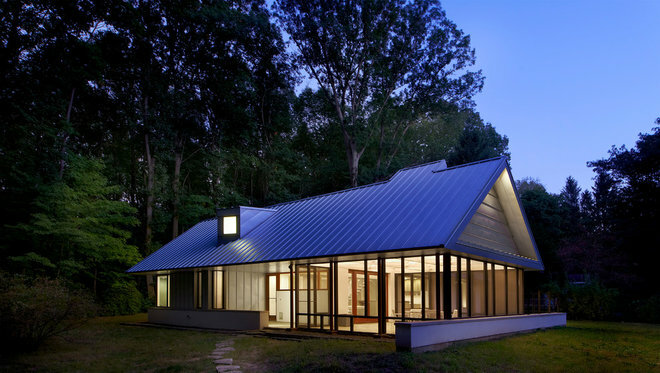 Working with architectural designer Brandon Andrzejcak and other team members from Searl Lamaster Howe Architects, architect Howe addressed the cottage’s major issues, including a leaky roof, a too-thin slab that wicked moisture and uninsulated walls. 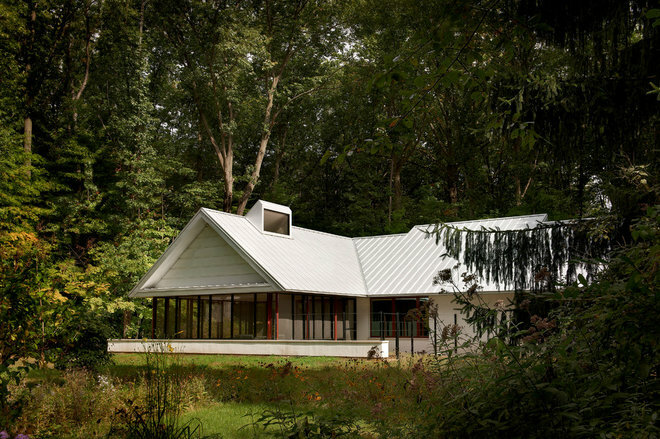 He designed a new, more steeply pitched roof to shed leaves and rainwater, rebuilt the slab and added insulation to interior walls. The porch was rebuilt as well, and window openings were expanded and added to bring more daylight to the interior. Before: Each spring and fall, Lonn had to climb onto the cottage’s not-quite-steep-enough roof to rake off acorns and leaves. The original roof framing was undersized, causing the roof to sag. The new roof includes structurally insulated panels that add insulative value. Dormer and clerestory windows add more natural light to the interior. A low garden wall helps define one side of the cottage. By night, a frosted glass window in the utility room serves as a lantern for the entry. 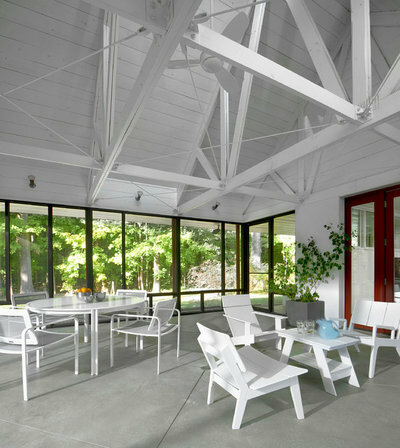 The red door and window frames recall the color of the home’s original steel-framed windows. 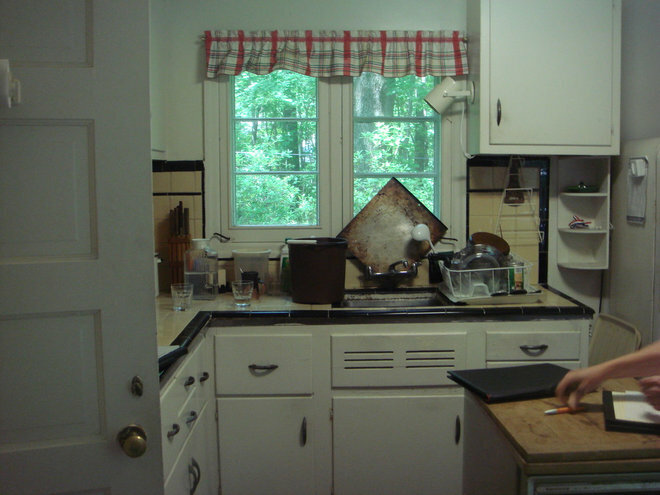 Before: The original kitchen was indicative of the cottage’s vintage materials and room scale. In the renovation, the kitchen was replaced with a new master suite, and the new kitchen was expanded into what was once part of the old master bedroom and dining room. 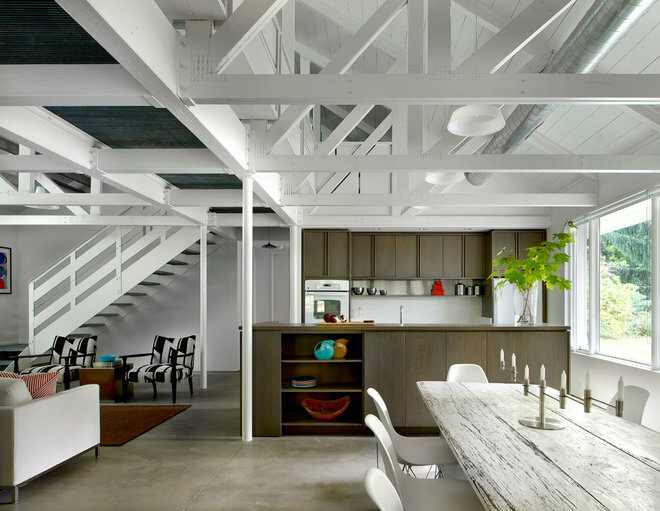 By removing a few interior walls, the architect created an open space for living, dining and cooking. 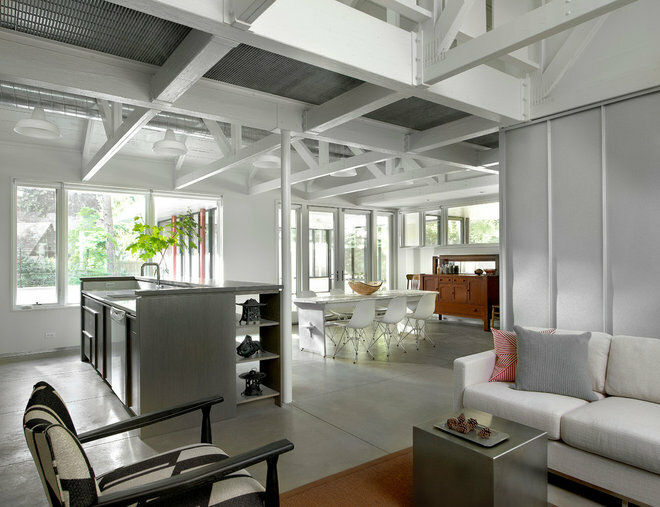 Exposed trusses support the new roof and add architectural interest to the interior. The raised ceiling line yielded a space for a mezzanine-like storage area connected by a catwalk and accessed by the staircase. 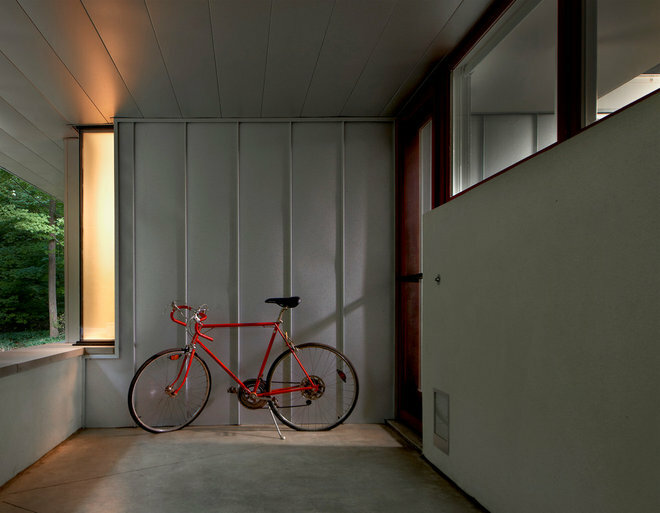 The polished concrete flooring is a result of a new, thicker slab, warmed by radiant floor heating. A new geothermal well supplies the floor heat, as well as hot water. The owner added his personal touch with the old dining table, which he purchased from a local inn. Simple, rift-sawn white oak cabinetry creates an efficient kitchen that serves as a fulcrum between living and dining spaces. Beyond the dining table, the owner’s vintage sideboard recalls the cottage’s previous incarnation. A landing atop the stairs to the mezzanine provides a view of the new open floorplan. To the right, cabinetry between the posts provides storage opportunities along the catwalk. Exposed ductwork is part of the new forced-air system, which provides supplemental warmth to the radiant floor heating as well as air conditioning, which was necessary to keep lakeside humidity at bay. The rebuilt screened-in porch serves as the home’s de facto living and dining room during warmer months. A commercial storefront window-framing system and the exposed trusses help the porch seem more substantial and permanent. 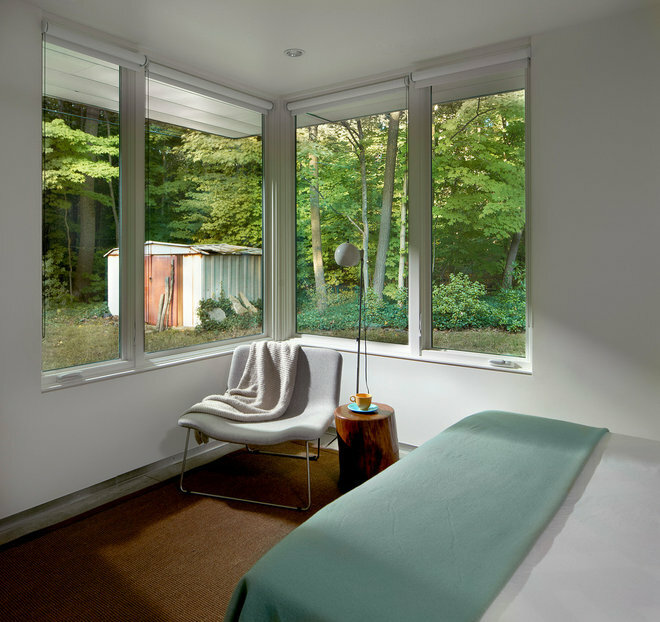 The new master bedroom has a view of the garden, courtesy of energy-efficient windows. Simple roller shades provide privacy. The home’s original tool shed remains, its weathered condition serving as a reminder of the renovation project’s starting point. Buffet or Sideboard – Which One Do You Really Need?